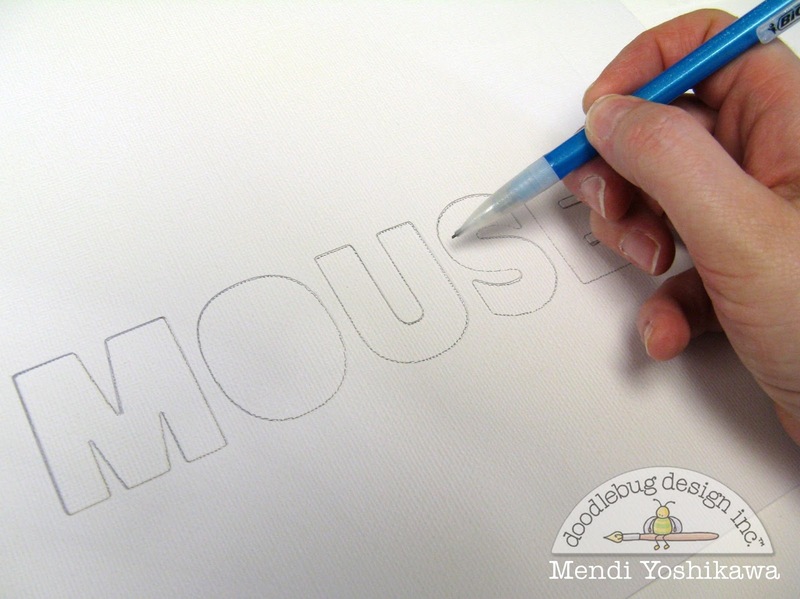 To create my title I die cut the word "mouse" on my Silhouette using this font and playing with the letter spacing a bit to allow a little extra room around each letter. I made sure to measure where I wanted to word to sit on my page and then used the grid lines within the Silhouette software to position my title so that it would be cut from that same spot on my overlay. Afterwards I traced my letters onto a white piece of 12x12 paper that would become my page base. 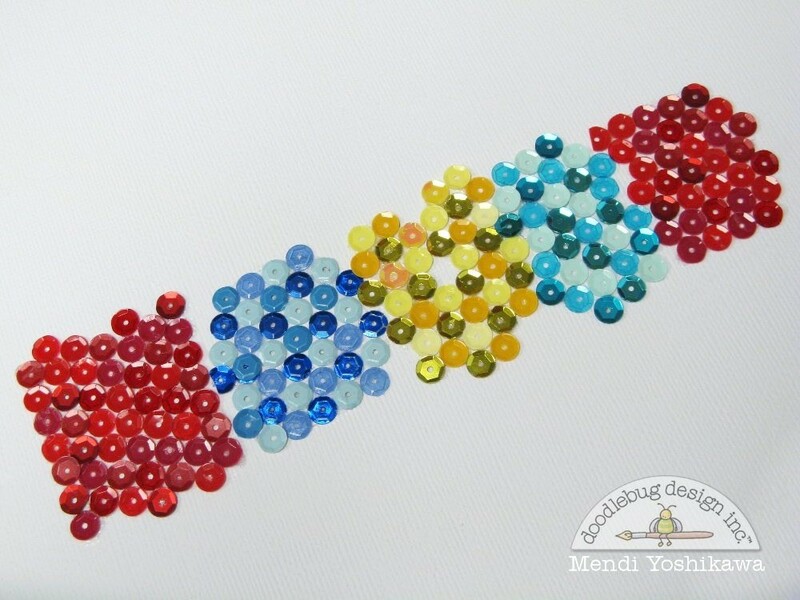 Originally I thought I could use any random piece of scratch paper, but because the sequins are circles and some of them are transparent, you will see a little bit of this paper below so you will need to select something neutral. After tracing I set my die cut sheet aside and set to work adhering my sequins to my background. I choose to use a Beacon's 3-in-1 liquid adhesive. At first I started by filling an entire letter with glue, but it dried too quickly so I learned to work in small patches at a time, starting from the center of the letter and working out towards the edges. In a couple cases when I would put the die cut overlay over the top, I could see that some colors were overlapping into another letter so I just clipped those sequins in half. It's so gratifying to put the die cut overlay over the top! I finished my title with some Loopy Lou alphabet stickers and some Arrow Sprinkles. 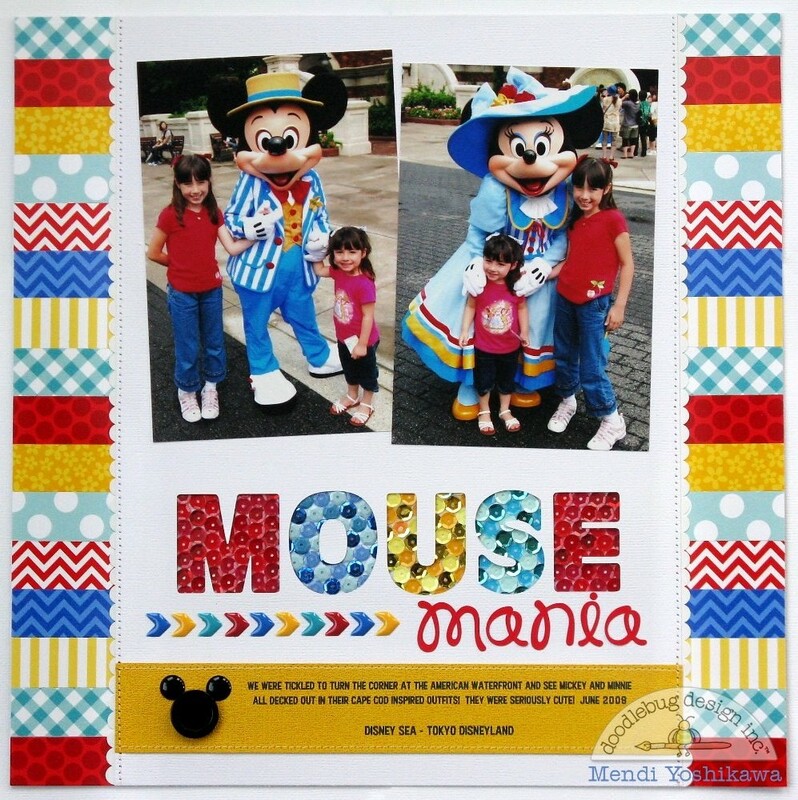 Before I go, I also have a quick little banner shaped card I created using the new Chevron Washi Tape Assortment. I knew I wanted to set the washi tape at a diagonal and the banner shaped card took the guesswork out of figuring out what angle to place them at. I simply cut my card front piece in half down the center and then set to work covering each side with the rainbow chevrons, folding over the excess to the back of the card front. When I was done I created a center band cut from white cardstock to hide my seam and adhered everything to a coordinating card base cut from my Silhouette (any pennant shape will work for this--I simply stretched my dimensions to be A2 size, 4-1/4 x 5-1/2). I never thought about doing letters that way. Thanks for the idea! LOVE those letters....just amazing Mendi!!! OMGosh - the colors on this page are wonderful, and that sequin title rocks! The sequin title is really creative! 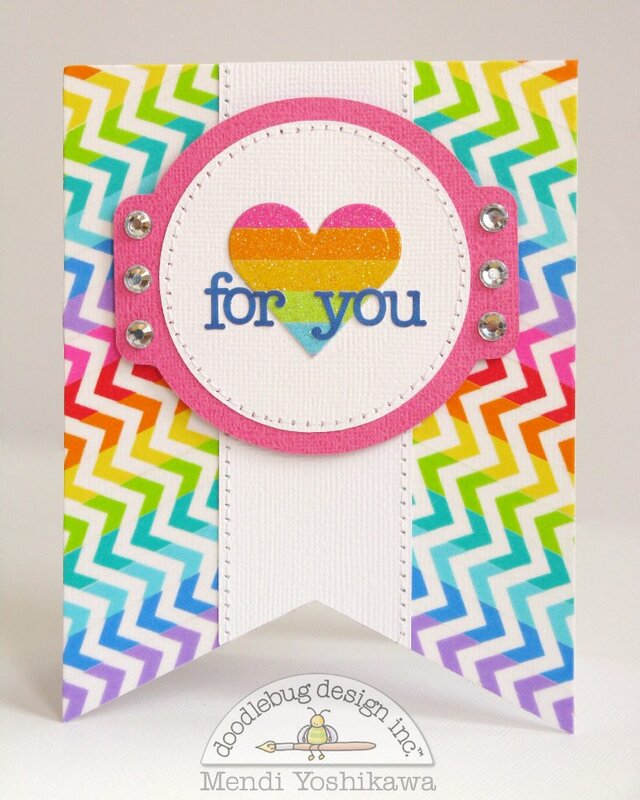 Love the chevron enamels and the card is really fun!! So bright and colorful! Love the sequin title! 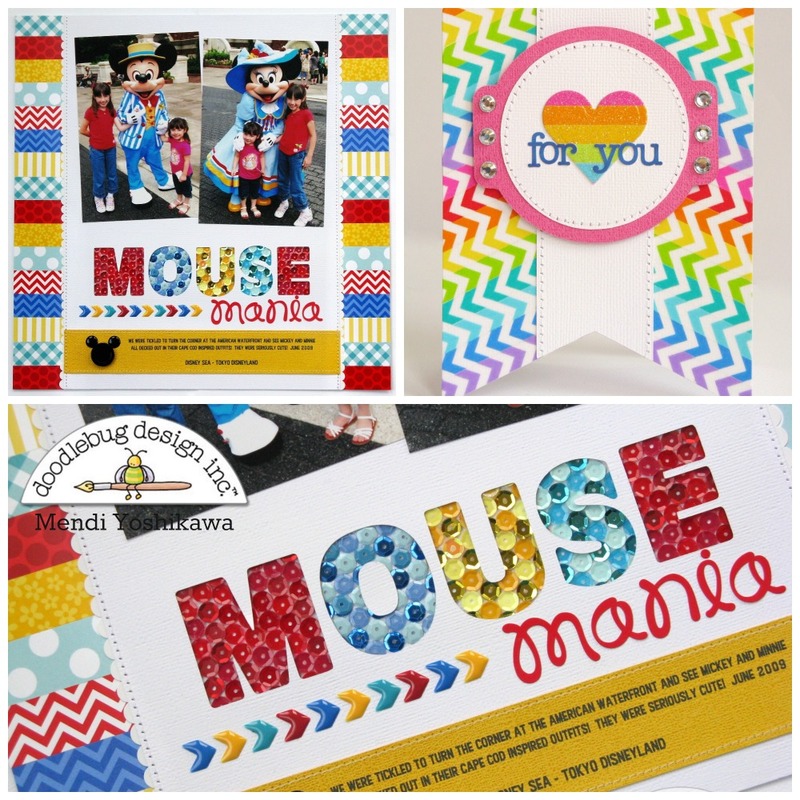 I absolutely love these washi and sequin projects to pieces! 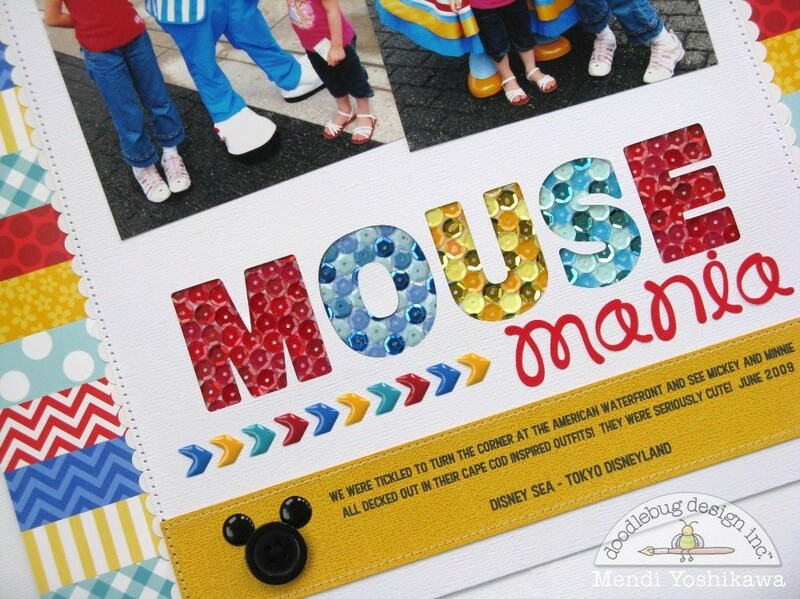 Very clever how you did the MOUSE title...looks fantastic! I LOVE your sequin title! Love the sequin title!!! Fab idea!! This is so fabulous and sparkly and cute!!! Wow!! Fun and cute and oh so colorful! Wonderful colors and creative use of the sequins! Love this! Absolutely wonderful projects! Love the title! Stunning layout, love how you created the sequin title. Thanks for the tutorial and tips on it! AWESOME layout and card - LOVE them BOTH!! !